It is perhaps the accessories that make the difference between looking good and looking great. We have a huge range of accessories that will help you co-ordinate your chosen suit with the bridal party. We also have many options to provide you with keepsakes and gifts for those who have helped and supported you to make your wedding day the best day of your life. It is the waistcoat that gives you the opportunity to give your chosen suit that personal touch. We have a wide range available in all sizes and if you cannot find exactly what you want then we can make waistcoats using a fabric of your choice. See our extensive waistcoat range. For those looking for the full traditional style we can provide top hats, gloves and canes. We can also provide braces that will colour co-ordinate with your choices. As with the waistcoats the cravats and handkerchiefs offer the ability to colour co-ordinate your suit with the bridal party. What ever you need we can provide it. We can even get cravats and handkerchiefs made to order from the same fabric as the bridesmaid's dresses. Not perhaps the most exciting part of the mens outfit but an important part all the same. We care about all the little details and that goes for the shirts and cufflinks. 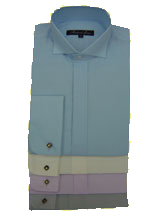 We'll make sure the shirts fit perfectly and co-ordinates with the other items chosen. We also carry a vast selection of cufflinks, from wedding specific designs to every day designs that can be used after the event. Cufflinks make the perfect gift to the best man and ushers to show your thanks.